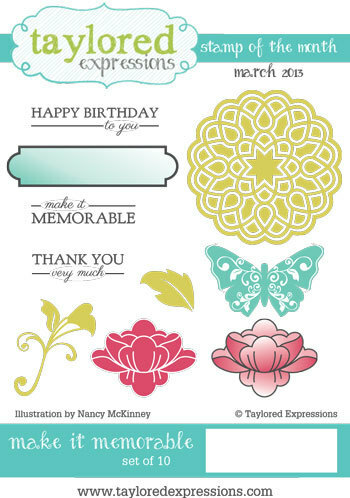 The Stampin' Bean: Taylored Expressions March Stamp of the Month Blog Hop! 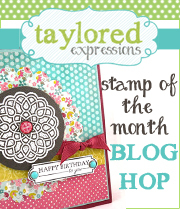 I am really thrilled to be a part of today's Taylored Expressions March Stamp of the Month Blog Hop! If you've hopped over from the uber-talented Monika Davis's blog, you are in the right place. 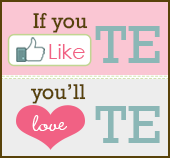 If you ever get off track, just follow the link list at the end of this post...you'll want to because TE is giving away a fabulous prize to celebrate the debut of Stamp of the Month! THE PRIZE: a March Deluxe Key Ingredients kit, which includes the stamp set we are using today, plus the March Key Ingredients kit! Keep reading for details on how to win this fun prize. Every month, Taylored Expressions will release a new, exclusive stamp set as part of its Stamp of the Month Club. Each set is designed to coordinate with that month's Key Ingredients kit (patterned paper, coordinating cardstock, and ribbon), so you've pretty much got everything you need to create some gorgeous projects. This month's set, Make it Memorable, is stunning, and I couldn't wait to play. There are also coordinating dies (sold separately), which you can see here. 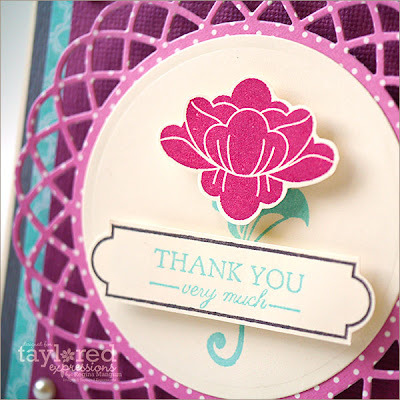 I wanted to make a thank you card -- they are still my favorite kind of card to make -- and I stamped the solid floral image, keeping things simple with a pretty die-cut doily. I love how the sentiments fit so perfectly inside the pretty frame. Very Pretty card! Love your blog too! Fabulous card! Love all the layers and dimension! GOR-GEOUS! This is a great kit, and I love what you did with it!! Very, very pretty! I love the doily pop and the colors! I'd Love to win this prize!! Beautiful card! I love the colors and the popped up flower is so pretty. Such a pretty card with a great focal image! This stamp set is so nice! This is just GORGEOUS, Regina! LOVE the colors you chose to use! Love that flower. The color combo is so pretty. Your blog is awesome and the card even more so!! These colors are just beautiful together. I love how you used colored ink to make them pop. What a fabulous card and fabulopus dies!! Beautiful card. Love the lacy layer. Love this stamp set and your beautiful card. I just love your card - it is so beautiful. It made me want to stop the blog hopping and get to crafting! Beautiful and bright colors. I love it. The jewel tones look so pretty together. Great job, missy. Fabulous card, love the colors and design. Very pretty Regina. Love the doily behind the circle panel. ABSOLUTELY. FABULOUS. Wow -this one pops right out of the computer! So fresh and pretty! Regina, this is so elegant! So very pretty. Your card is gorgeous. Love your stamped image and how you put that in the doily. Love the simplicity of your main image.. the polka dots on the doily are so sweet. this looks like a fun kit. Thanks for the chance! I like these two colors together! I can't wait to play with them myself! Love the layers and those yummy colors, Regina! Beautiful, Regina! Love the colors and the lovely pink bloom! Very pretty card Regina! I love that doily die cut. I love looking at your work, Regina, what a gorgeous card! Love the color and layout, what an eye catcher! Sooo pretty! Love the flower popping off of the stem! Beautiful! What a great color combination, and I love how striking that flower looks popped out like that! Great card! Good for many occasions. I love the colors together. Very pretty images on this gorgeous card. Hi Regina! This is gorgeous!! Love the colours, the layers and your card looks amazing!! I need to have this set :) Thanks for sharing!! 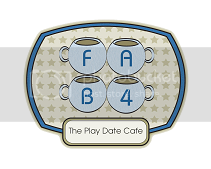 Your card makes it SO TEMPTING to get that frilly circle die cut! So beautiful! Wish I had a blog. I just do not know the ins and outs to have one. Your card is very pretty. Beautiful! I love how you popped up the flower and label. Wow! I love this one! The colors go so well together and I love that doily die, too.